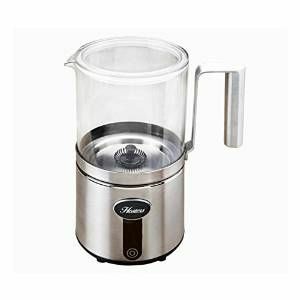 With its contemporary styling the Hostess HM350A milk frother is ideal for lattes, cappuccino's, espresso's, hot chocolate and milk shakes, it can even make hot chocolate from solid chocolate pieces. Featuring 2 heat settings plus a cold setting it has an easy to clean 350ml capacity glass light weight jug which is dishwasher safe and can be used left or right handed. Supplied with 2 frothers and 1 stirrer which can be housed under the unit when not in use.